Hi everyone. Time for another challenge at Addicted to Stamps & More - Addicted to Colours #38 (regal rose, sahara sand, tempting turquoise). 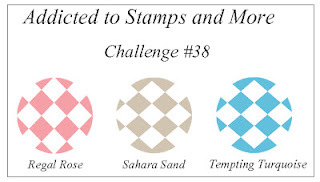 You can make any style of card you like ... but please keep it to the colours from the challenge as well as neutrals (brown, black, white, ivory). You don't have to use the specific colours mentioned above from SU! ... use whatever you have that is close to those three colours ... and have fun! I used this sweet digital image from Bugaboo, sized it to what I wanted and printed the image three times (card front, watercolor paper, polka-dot dp). I cut the image out of the watercolor paper and used my blender pen and inks to color it (marker layering technique). I cut out the balloon from the polka-dot paper and then covered it with Crystal effects. When everything was dry, I glued it onto my card front on top of my printed image (paper piecing). I added some faux stitching with my Stampin' Write marker and then stamped the sentiment onto a large cloud. Loll, love your Bunny card, adorable, color balance is perfect, so very sweet. What a cutie!! 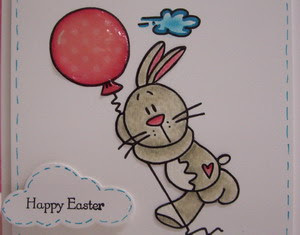 Such a sweet little bunny and the effect on the balloon looks amazing, it adds depth and interest, I really like it! Super cute image Loll - love it. Kylie picked such great colours for this challenge - they are so complimentary. Great "scooty" cloud! 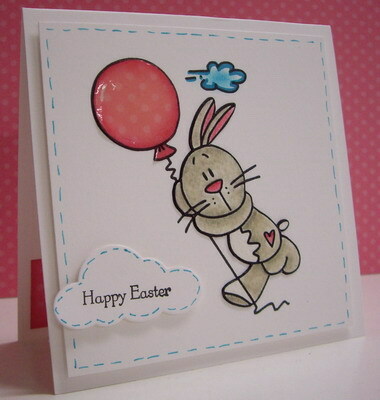 Fabulous fun card Loll... love how you've accented the balloon... and that stitched mat die makes it perfect! I used mine over and over again.. always makes a card elegant! What a fun card, cute stamp and great coloring. Love the balloon. I need to work with crystal affects and see if I can get that look! Love it. Your cute fun card is gorgeous, Loll. What a cute little bunny! Great coloring!